Bancroft’s story begins in the family kitchen where he spent most of his childhood and teen years. He loved nothing more than to visit extended family as a kid, because it was there he found all of his culinary inspiration—eating food raised and grown just outside the table he sat at with the people he cared for the most. Inspired by his grandfather, who was not only a farmer but an entrepreneur as well, he witnessed how to live sustainably and create his own opportunities early on. In his freshman year at Auburn, when he became bored with school, it seemed he was often cooking more than going to class. He appealed to his father to allow him to leave business school and attend culinary school instead. Hoping to gain some experience and show his father how serious he was about his dream, he began working at Amsterdam Cafe. He was thrown in the back of the cook line, but that didn’t deter him from his willingness to grow and love of making food. His hard work showed; he eventually left school because, in just a year’s time, he was named head chef. After six years as the executive head chef, he left to build his dream farm-to-table restaurant—Acre. With history and heritage at the base of his inspiration, he created a home in his restaurant. With walls made from wood from his grandfather’s farm, family pictures lining the hallways and his children often running through the restaurant, it’s these details that create a heartbeat in Acre. 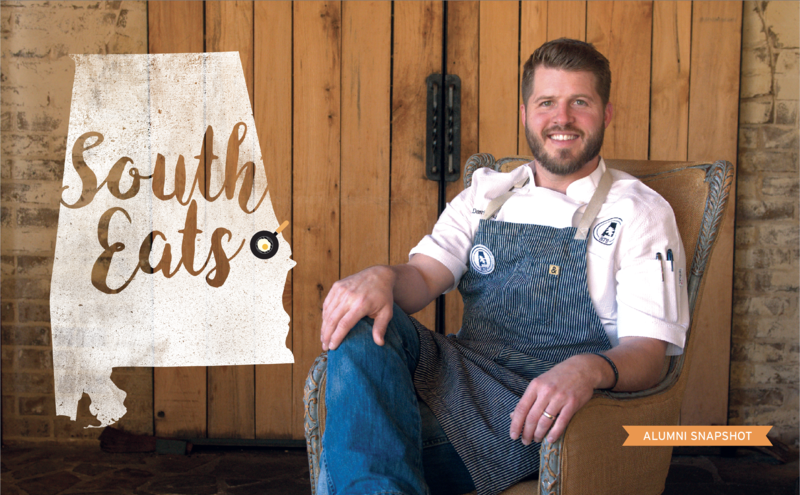 His unique take on Southern dishes put a spotlight on Bancroft and has earned him a nomination as a semi-finalist of the James Beard Foundation’s Best Chef of the South. But when he got the call to compete on one of his favorite shows, Food Network’s “Iron Chef Showdown”, he couldn’t believe it. During the show’s filming in July 2017, he shut the restaurant down for four days while he and his team went above and beyond in preparation. It was worth it. His focus on his own brand of cooking and devotion to his southern roots brought him his victory over his idols like renowned pastry chef Michael Laiskonis and Joe Garces. Required to keep quiet about his win for five months, Bancroft was overjoyed to finally celebrate with his family and friends, closing the restaurant for a private viewing of the show with the people that helped him achieve his dream. “It’s the community that means the most to me,” Bancroft said. On the show, he dedicated his win to his family, wife, team and Alabama.